In this chapter, I consider semiosis as the continuous production of signs and significations. However, I do not limit the scope of signs to marks or inscriptions. I consider individuals as signs too. Like signs, individuals come to occupy positions in the social world and behave in ways that are not at all different from signs in a text. A crucial difference between inscriptions and individuals, though, is that individuals are not merely signified through well-defined syntaxes as inscriptions and traditional signs are. The cultural syntaxes through which individuals come to be positioned in the social world are less visible: they are part of a dynamic cultural symbolic superstructure. Another crucial difference is that, unlike inscriptions and marks, individuals co-produce themselves—even if it is within the limits of the aforementioned symbolic superstructure. Individuals co-produce themselves in what in this chapter I term processes of subjectification. 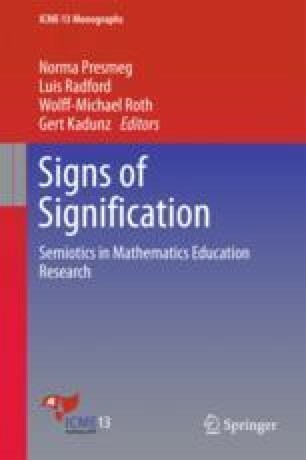 This chapter is an attempt to study the processes of subjectification in the mathematics classroom. To do so, I analyze a classroom episode with pre-school children.